I attended the final day of the Magic Millions sale on the Gold Coast hoping I could acquire at least one yearling by the exciting new stallion, Exosphere. I was attracted to Exosphere because he had such a wonderful turn of foot. When he won his races, he put them all away quickly, looking lengths better than any of his opposition. He was retired early by Godolphin which appears to be a great recipe for success. The lighter raced stallions, including Rory's Jester, Bletchingley and Redoute's Choice all had less than 10 starts, like this stallion. I managed to secure, Lot 889- a colt by Exosphere, out of a Zabeel mare, Za'atar. Za'atar is a full sister to Zagrab, who won the Naturalism, 2nd in the SA Derby and 3rd in the Australian Cup. This colt is very much in the mold of Zabeel, big, rangy and a very good walker. I am in the process of breaking him in where he is showing me he is very intelligent, interested in his surrounds and is eating well and learning quickly. The plan is to finish educating him and then send him to the paddock to mature and return for his first full preparation in November this year. Target races for him will be the 2020 VRC Derby. He is exceptionally priced at $6,500 including GST for a 10% share, which also includes transport to Melbourne, insurance for the first year and breaking-in. 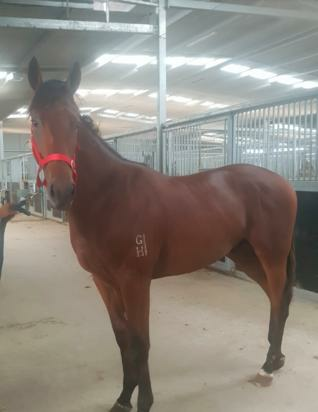 This colt will be snapped up quickly, so if you are interested, please contact us at relaingracing8@gmail.com to arrange a viewing.